Jill, send me an email (molliejohanson at gmail dot com), and I'll have Kara get in touch with you so you can choose your class! Congrats, dear! Now, onto something stitchy, and Scissor Quirky, and Bubbly Shnooky. Michelle Clement is an animator and illustrator (which means that I instantly respect and adore her! ), and she shares all kinds of other creative things on her blog Scissor Quirk. Sometimes I forget that she has this super cute shop called Bubbly Shnooks, which is silly, because it's super cute. 1. 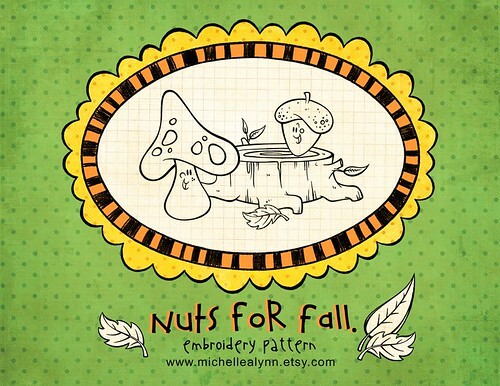 Visit Michelle's shop and blog, then come back and tell us what your favorite thing was that you saw. 2. Follow the Scissor Quirk blog for an extra entry (leave a separate comment). The giveaway will be open through Sunday night at Midnight CST, and I'll announce the random winner on Monday (November 1! Yikes!). Wow - what a nice blog and cute different stuff. I love the anthropod elvis - it made me laugh. How cute are those?! I really liked Mr. Moustache, even though I don't know anyone with one! That Mr. Mustache embroidery is way too adorable! i love the mustache items! they are adorable.